If you want a shed that has a very smart appearance, then the Empire Pent 8×10 Shed With 3 Windows could be just the shed you are looking for. 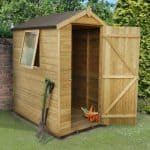 This is one very classy, smooth and modern looking shed that is sure to stand with pride in any garden that it is placed in. The shed offers you plenty of room to store all kinds of items like tools, bikes, gardening equipment and anything else you are sick of cluttering up the house. The shed offers plenty of headroom so moving around inside here is going to be a comfortable experience. Three windows placed in a clever location will make sure you get all the natural light you will need in the shed. As you can see, this is one very smooth looking shed and the reason for that is the tongue and groove shiplap cladding they have used. This cladding will keep anything Mother Nature can throw at it out, but it is also pressure treated. This means that there is no need for you to waste your time treating the shed. The whole structure will have a good and solid feel to it thanks to the impressive framing that they have used inside. In all this is a shed that is easily going to give you 20 plus years of use. The Empire Pent 8×10 Shed With 3 Windows certainly does have a very interesting look to it. Here at WhatShed HQ we have knocked around a few ideas what it looks like and a bird watcher and a bunker you watch nuclear explosions from seem to be the favourite. In all seriousness though, this really is one smooth and smart looking shed that has a lot of style. This offers a lot of floor space with the width of the shed being 9 feet 8 inches and the depth 7 feet 9 inches. The headroom on offer here is great as even at the lowest point it stands at 5 feet 7 inches and then slopes up to well over 6 feet at the front. For the roof they have gone for a pent style roof and we think that it works very well. What we really like about this roof is the way the slant is so steep. This means that any rain that falls on here is going to always run right off the back. The roof is made with 8 mm thick solid sheet boarding which, if we are being honest, is not the nicest looking boarding, but it is strong enough to take the weight of many inches of snow. For some odd reason they tell you the thickness of the roof, but not the cladding! 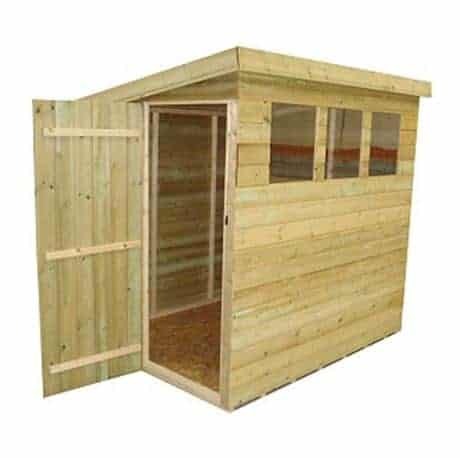 Anyway, at a closer glance, we would suggest that the Empire Pent 8×10 Shed With 3 Windows has 12 mm thick tongue and groove shiplap cladding. We love this style of cladding they have used on here. It has a very silky smooth look to it and you can tell right away just how tightly together those boards are. There is no way any rain is getting in here – of that we are certain. No mention of the frame is made, but thanks to the pictures you can see that there is a good framework inside this shed. At an educated guess, we would assume at the very least this frame is 28 mm x 28 mm. From looking at the pictures, you can see this is a very well made frame and we are sure it will keep the shed very strong. The one thing we are not too happy about with this shed is the floor. They have used the same kind of solid sheet boarding for the floor as they have the roof. If this was a £300 – £500 shed we could maybe look past that, but at over £600 we do feel that they could have put some nicer looking tongue and groove boarding in here for the floor. The solid sheet boarding floor will be strong enough, but it really stands out like a sore thumb when you consider just how good looking the cladding is. Still, for some, we are sure this will not be an issue as many people do not mind what the floor looks like. 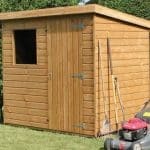 The main reason for the rather high price tag of the Empire Pent 8×10 Shed With 3 Windows is that the wood is actually pressure treated. So you do not have to worry about treating the shed at all. 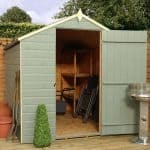 The shed comes with a ten year anti rot guarantee, which thanks to the pressure treatment process the wood goes through, you should never have to use. On one end of the shed is the door. This is a single door, but this was to be expected. We actually really like the way the door looks on the end of the shed and think it was a smart design choice. The vertical cladding on the door looks fantastic and the three braces on the back will make the door feel quite strong. Right on the front of the shed are three fixed styrene windows. We love the look of these windows and think that their placement really does give the shed a lot of personality. We like how they are placed high and spread out evenly so you will get a good amount of natural light in the shed. If you look very closely you can see that there is a turn button catch on this shed. Do not worry if you missed it, here at WhatShed we have eyes like a hawk so we notice this kind of stuff. A turn button catch does keep a door closed, but if you want to keep the door locked, then you will have to add some kind of padlock and hasp combination. Even with the three windows, this is still a very private shed. The windows are not that big and they are placed near the top of the shed so if you have more expensive items you could place them under the windows and people would never know. As the Empire Pent 8×10 Shed With 3 Windows is pressure treated there is not any need to treat it. But if you do want to add some coloured wood treatment to it in order to give it your own personal style, then make sure you check that it will not void the warranty. We do not think that it will, but it is always best to check. Apart from this there is not really any way that you can customise this shed. There are two extras for you with this shed. First of all is a Pro Shed Base, which is ideal if you have concerns about the area of the garden you are installing the shed on. This is priced at £49.99, which is not a bad price at all. The other extra they have is a hasp and padlock security kit, which at £4.99 is a cheap and effective way to give the shed some security. As the wood is pressure treated, this shed is going to give you many years of use. 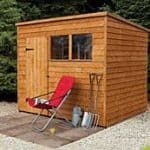 Just make sure you are not throwing or dropping heavy items on the floor and this shed will last you a very long time. The floor space this shed offers is very nice, but when you add in the fact that this is a very tall shed, you soon realise that you have a very generous amount of floor space on your hands. Like most other 10 x 8 sheds, you and the person you bribe into helping out are looking at around 8 hours at the most. This is not more difficult than any other shed of this size we have seen, so do not worry. Just know that you are not going to get this done in half an hour! While we really like this shed and love the fact it is pressure treated, we do feel that at this price range the floor should be made with tongue and groove boarding. 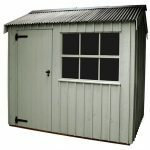 Final Thoughts: The Empire Pent 8x10 Shed With 3 Windows is the kind of shed that is perfect for those of you who do not just want a place to dump your tools and gardening items, but also want something that is going to stand out and be a positive feature of your garden. This is just such a great looking shed that it is impossible not to be impressed by the way it looks. The storage space it offers is going to be ideal for most people. While we have had a good moan about the quality of the floor, we must say that if you can overlook this then you will be very happy with this shed. 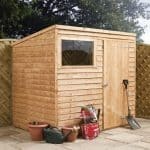 Plus, the pressure treated wood is going to make sure you get to make use of this shed for a very long time, so you will certainly feel like you got your money's worth.